According to reports, Graham, 93, met with Romney at his home in Montreat, North Carolina, during which the two shared cookies and soft drinks together. 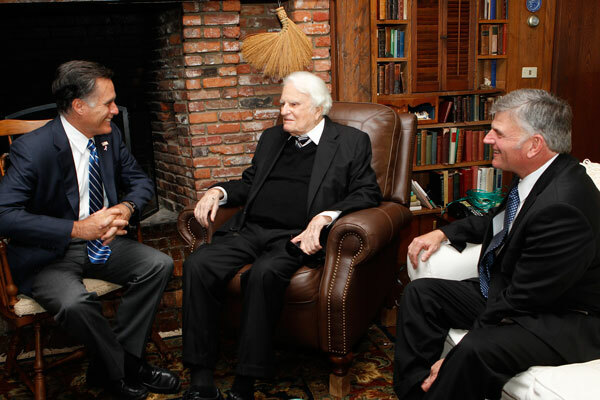 The meeting lasted approximately 30 minutes, and concluded with Graham praying with Romney. “I’ll do all I can to help you. And you can quote me on that,” Graham told the Republican candidate, a longstanding Mormon. Below is a copy of the deleted web-page. Well, mormons are a cult, regardless of what Billy Graham or anyone else says. When were they ‘de-culted’? I know that’s not a word, but man’s approval is not God’s approval. Might as well shake hands with a satanist as well as a mormons, for there’s no difference.